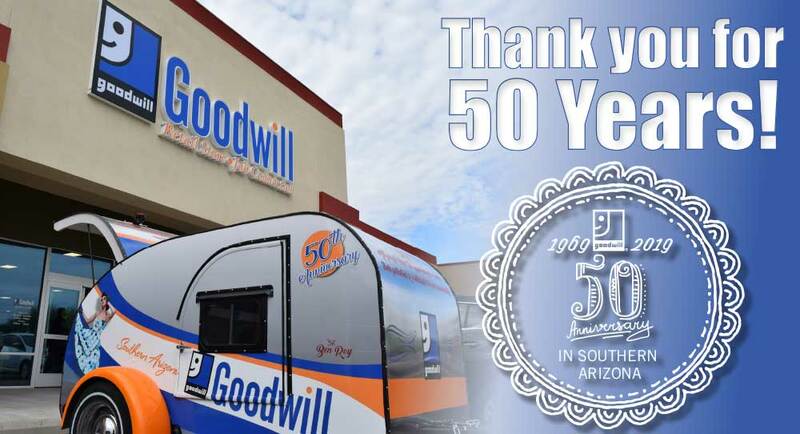 You are here: Home / 2019: Goodwill of Southern Arizona turns 50! 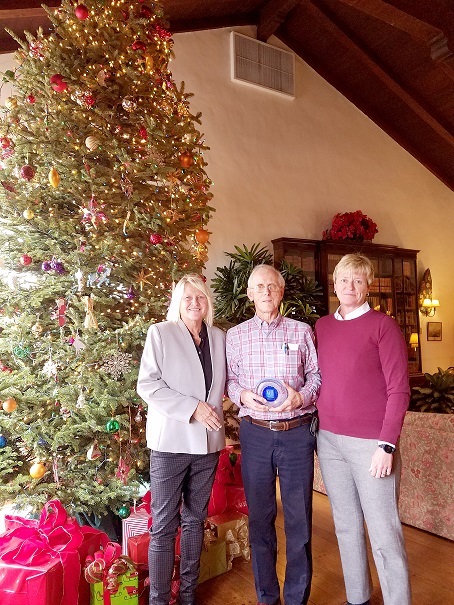 In 2019, Goodwill® Industries of Southern Arizona is celebrating its 50th Anniversary! Since 1969, Goodwill® has provided a “hand up” for any person who wants to achieve independence through jobs, education and skills training. This means helping individuals realize their potential, see and achieve their steps in the career pathways they set while providing support along the way. In the past 5 years alone, Goodwill® has served over 50,000 individuals. 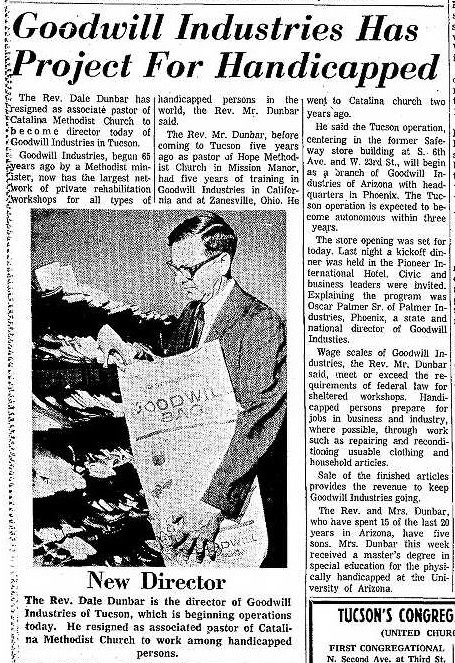 Goodwill ® was originally named Goodwill Industries of Tucson, founded in 1967 by minister Dale Dunbar, also Goodwill ® gained its non-profit status as well as becoming a corporation on September 19, 1969. 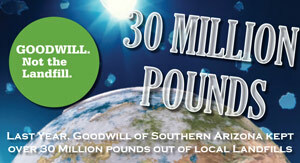 The organization officially became Goodwill® Industries of Southern Arizona on September 27th, 1994. Goodwill® moved to its Cherrybell facility in 1975, where it still operates today. The first Goodwill store was located in a former Safeway store building on the corner of S 6th Ave. and W. 23rd St. Goodwill’s first participants were adults with physical disabilities in a sheltered workshop where they would be trained for competitive employment by repairing and reconditioning clothing and other household items. Today, Goodwill operates the Youth Restoration Project, a program whose operational activities center around the repair, refurbishing and upcycling of mostly donated furniture while young adult participants work towards their career and educational goals – by getting their GED or HS Diploma, gaining industry experience through internships, while also learning the carpentry trade. Goodwill also continues to serve adults with disabilities through its Supported Employment program. 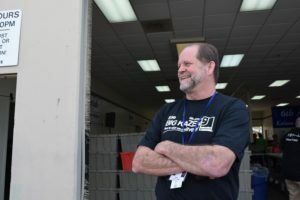 Participants now work within retail operations and thrift stores for a more integrated setting as they train to work towards competitive employment. 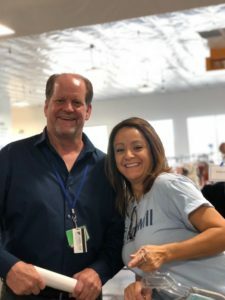 Goodwill® Industries of Southern Arizona is an organization that helps individuals at all levels in their career or education, gain skills and take advantage of opportunities available to them outside of Goodwill® and also within. After 15 years established in the construction industry and looking for a career change, Kevin Cunningham was able to restart his career with Goodwill®. He currently serves as the Retail Director and it will be nine years this May that he’s been with the organization. Kevin did apply and he called the manager and asked if he could make sure this application was at least looked at by HR. The store manager agreed to make that call. He was out of town when he received the phone call for an interview – the first call for an interview that he had received during all the time he was looking for employment! In addition, Goodwill® was willing to wait until he got back to schedule the interview with him. “Three weeks into it, I told myself, ‘this is an amazing company…I think this is a company I can grow with and help make a difference in our community. They care about their employees.’ To feel that, I was like, OK, I can stop looking for another job. Kevin also acknowledges that what we do today, as an organization will set up the next generation of leaders to succeed for the next 50 years. Thank you Southern Arizona for your support!